I’m not as anxious as I was at this point 2 years ago – but that’s because reality hasn’t sunk in yet. Am I really going to do this again???!!! So fortunate though to be running with great friends. We are raising money for Vitae Foundation. 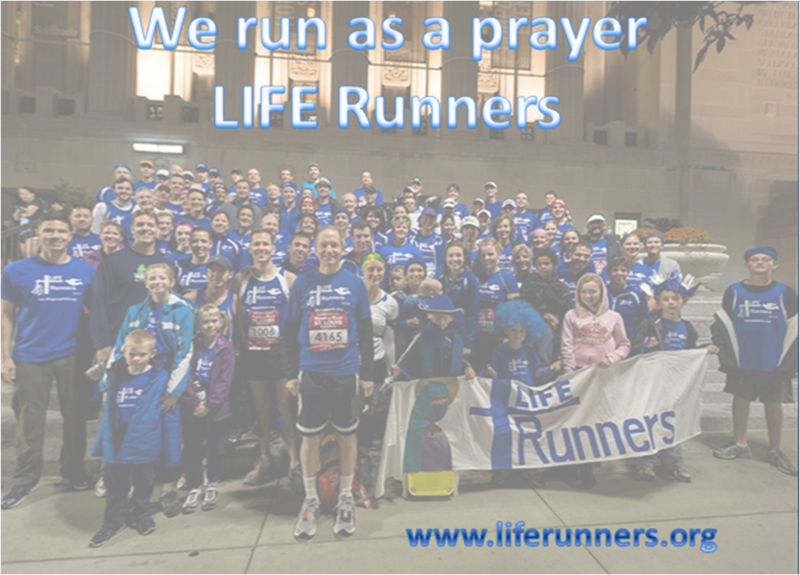 Running for a great cause makes all the difference and helping pregnant women in need find real help and support so they choose life is the best cause. As I look to my training, I think about my diet, hydration, running, cross training and how my training schedule has to integrate into my daily life as a priority. Here are the stats from training for my last full marathon in 2012. St. Louis Rock and Roll Finishers: 1,900 Full and 9,500 Half Marathoners. Race Recovery: Best yet. Very little swelling. Sore/stiff – toes took a beating. 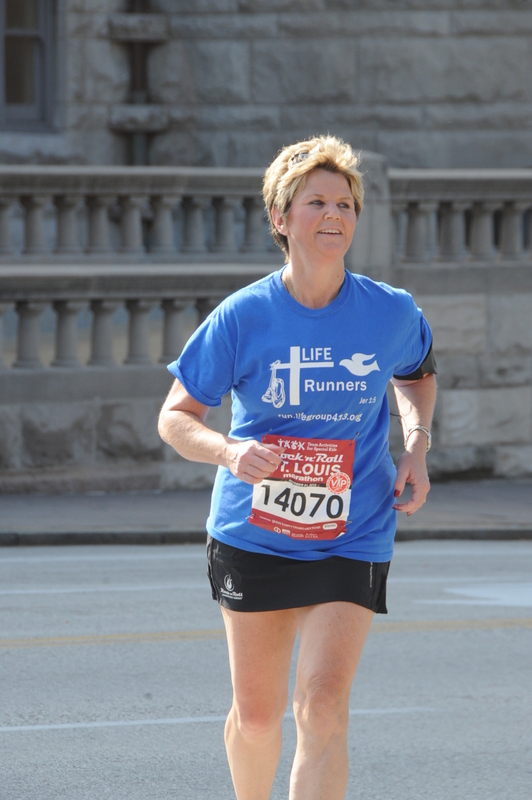 Marathon Fun Fact: Running…foot impact on ground is 4 x your body weight. One thing that stood out in my mind and forced me out the door for training runs 2 years ago was the voice in my head saying, “If you don’t train…you could die.” Sounds pretty extreme or alarmist, but it’s true. If my body isn’t conditioned for the full 26.2 miles it could end badly. So, that, if all else failed, pushed me out the door some mornings when I wasn’t into or didn’t feel like running. I look forward to the challenge and this time hope to finish with a better time. 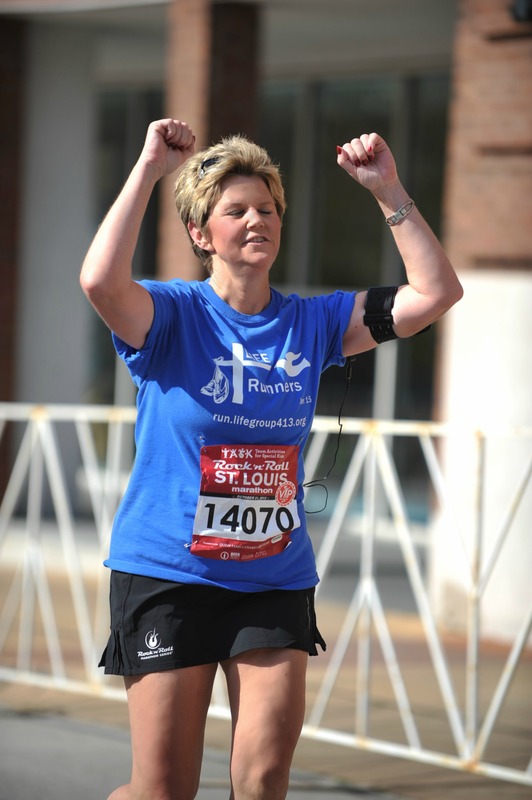 I remember doing great until the marathon cut off from the half at the St. Louis race in 2012. Then the miles became very lonely when the crowd I was running with all headed to the half finish line. I reached mile 17 and was hurting. The temperature began to rise too and some good hills were ahead – with plenty behind me too. I pushed through but had to walk about 3 miles. Once you start walking it’s so hard to start running again because you’re now feeling more of the pain and soreness. As I fought back to a slow run I would then have to walk a little too. My legs were like moving telephone poles. I teared up as I saw my teammates that had finished knowing I was getting closer to the finish. Then I saw my family that waited the 6 hours for me. I had beat back the urge to breakdown which was hard. A white fence lined the running lane the last quarter of a mile to the finish line. It has a turn or two also. I was praying so hard to fight through the pain in my legs it didn’t immediately register that this was it – just trying to make it to the finish. Then making the last turn and seeing it – was a glorious sight. So grateful to God for moving me across that finish line. I achieved something that I once thought impossible. Two years earlier I began my running journey training for a half marathon (2010). I was a non-runner/ex-smoker reaching for something I didn’t know much about. So I researched it. Read a lot from online sources and books. Then through trial and error, made it across that finish line in very cold rainy April NYC weather – just under the cutoff too. I was so thankful to finish. The following day, visited the NYRR club to pick up clothes bag that was left. It was while I was there that I met a member on his way out. He heard me say something about running in the More/fitness Half Marathon the day before. Up to that point I figured finishing behind the pack and just under the cut off was not going to impress too many outside of myself and maybe family. He stopped in his tracks, turned around and said, You were in that race yesterday in Central Park?” I told him I was but that I was one of the last ones to finish. He said, “That was one brutal race. Our club director, an Olympic runner, was treated for hypothermia along with several other runners.” He said that there were many that didn’t finish because of the rainy cold weather – some very seasoned runners too. I was so surprised. He made me feel so much better. Later, I pulled together all of my lists and information from my research then crafted it into an article and published it on HubPages in 2011. It has since become a Hub Pages “Featured Article” and is the first one up (out of 30) under “Marathon” on their list. Each day about 130 people read it. To date has had 30,000 views, shared by many and still going strong. I experimented with ads and over last 15 months it’s earned me $100 to date. The first $50 took about a year. The second $50 just 4 months. Cool stuff. Maybe one day it will support me so I can live my life on a sea-shore writing that novel or something. 🙂 Yeah, I’d have to live to be 105 and don’t start writing till then. Follow my training and let me know how your running is going. What races are you registered for? 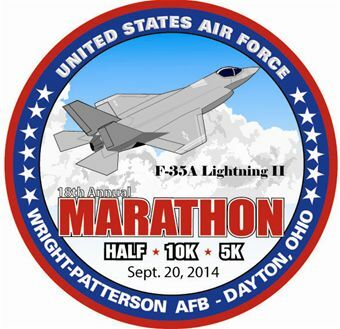 Is anyone else running in the Air Force Marathon? Have a great day and let this video inspire you to the finish. This entry was posted in Article, running, Training, Video. Tagged half marathon, Hubpages, Marathon, More/fitness Half Marathon.